Time will fly by as you learn from our top-ranked instructors on how to improve your skills and techniques. Participants will gain an understanding of the specific requirements necessary to build a “best-in-class” quality monitoring and assessment process. This approach is designed to meet the needs of the enterprise, the center, the agents and the callers. Participants will identify those agent behaviors that provide an excellent customer experience, i.e., reduce the customer effort to solve their problem, answer their question and drive loyalty. From this knowledge comes the development of the assessment processes, form for assessment and the scoring metrics that will measure the result. Participants will explore the issues relating to calibration of the assessment and scoring processes, and how to deliver appropriate recognition and reward for those involved in the process. This workshop will provide real-life example and exercises that will allow participants to assess the current programs, make adjustments or develop an entirely new program that meets the needs of all stakeholders. Signing up today and need an Early Bird Discount code right away? Contact us to receive your discount. Center of Excellence Members - 15% off. Please contact your relationship manager or review your certification notification letter to get your preferred partner discount code. Discounts cannot be combined with other offers or discounts. If you have 2 or more individuals that would like to take the call center training course, please contact us for a group discount! 1-800-214-8929 Ex. 1 or Email Us Today. Group discounts cannot be combined with other offers or discounts. Groups must all be submitted and registered at the same time in order to receive the group discount. All students attending a Live Online course have up to thirty (30) days before start date to cancel registrations for a refund. Any cancellation within 30 days will become a credit for a future live online course. Credits must be used within one year (12 months of issue). Any cancellations or transfers within 14 days before the course will incur a $250 late cancellation/transfer fee. This fee will be deducted from your credit. In the event that we do have to cancel a training course at the last minute, your relationship manager will contact you to either reschedule you in to an alternate course or provide you with a full refund of the course price. No shows will also pay full course rates. All students attending an In-Person/Classroom course have up to thirty (30) days before start date to cancel registrations for a refund. Any cancellation within 30 days will become a credit for a future course. Credits must be used within one year (12 months of issue). Any cancellations within 14 days before the course will incur a $100 late cancellation fee. This fee will be deducted from your credit. BenchmarkPortal cannot be held responsible for penalties resulting from travel arrangements of any kind. In the event that we do have to cancel a training course at the last minute, the college manager will contact you to either reschedule you into an alternate course or provide you with a full refund of the course price. No shows will pay full course rates. Full payment is required 1-day prior to attendance. If you are purchasing more than one course with a business credit card please check your daily limits to avoid any possibility of the transaction getting declined (most cards have a $1,000 daily limit). After completion of a Live Online Course, you will receive by email a Certificate of Completion. 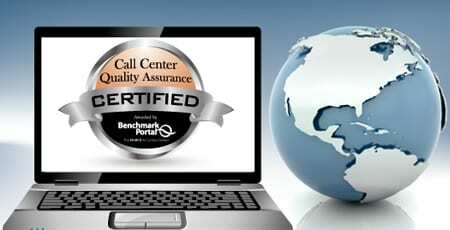 Certification through BenchmarkPortal and the College of Call Center Excellence is an achievement that is recognized internationally. The recommended internet speed is 2 MB & the minimum speed is at least 512 KB for the download speed on DSL or Broadband connection (wired or wireless). "I loved taking this course. I have taken a few training classes and they were a bit boring. I liked the fact the trainer (Amy) was very friendly and called on different people. This was a very excellent and well delivered course. It was good fun and informative and well structured. Thank you for everything. I don't know where to begin and can't wait for Monday to start applying all the new ideas I have." "This was a great course and provided helpful information. It will bring great success to any manager." "It was great interacting with others who are going through the same thing that we are...struggles and triumphs!" "The instructor was excellent and had a great personality! I really enjoyed this course." "This was a great experience. I learned a lot and am taking back some practical tips about QA to share with my team. I also enjoyed the feedback from others that attended." "There were a lot of great insights and best practices identified that we'll be considering as we are in the process of evolving our QA program. Thank you!" Veterans Administration Health Resource Center National Government Services/WellPoint Egis Projects Canada Inc.